HONOLULU – The Hawaii Department of Transportation (HDOT) Airports Division is pleased to announce the HNL Interim Car Rental Facility is slated to open Wednesday morning, Nov. 4, at the Honolulu International Airport. The car rental companies are currently making their final improvements to the building. The new facility, located on the eastern half of the Overseas Parking Structure, will consolidate the five existing car rental companies on the airport premises into one location. The facility will house Advantage, Avis, Budget, Hertz, and National car rental companies. It will also feature a new car wash, fueling stations, customer service building and hassle-free car pick-up/return areas. The building is a short walk across the street from the Overseas Terminal and Baggage Claim area. Busing accommodations between the airport and car rental facility will be provided. The $30.9 million project began in February of 2014. The project is funded by a Customer Facility Charge which consists of a daily charge of $4.50 for all rental cars. The HNL Interim Car Rental Facility project will enable the car rental companies to operate from the interim facility while the permanent Consolidated Rental Car Facility (CONRAC), a major component of the Hawaii Airports Modernization Program, is built to the east of the Overseas Parking Structure where the current rental car companies are located. The 5-story permanent CONRAC will feature approximately 2,250 parking stalls compared to the current 895 existing parking stalls. It will also have a common busing operation utilized by all the car rental companies that will transport passengers between the CONRAC and airport. All customers will be able to take the same shuttle to the new facility instead of waiting for the individual company vehicle. It is expected to open in late 2020. 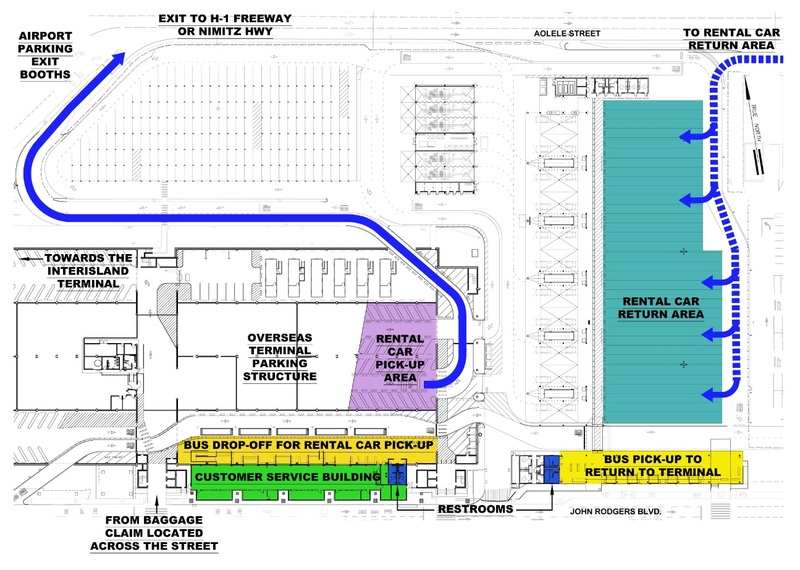 Click here to view a map of the HNL Interim Car Rental Facility.